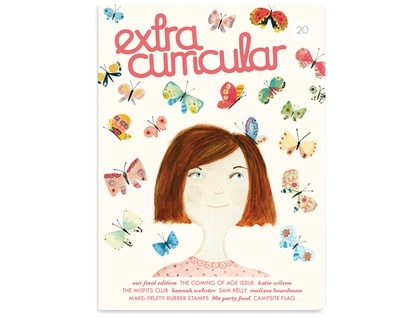 Here it is folks - the final issue of Extra Curricular! In our coming of age issue we contemplate what it means to have 'made it' as an artist – we hear from cover artist Katie Wilson, bird-watching illustrator Melissa Boardman, jeweller Sam Kelly, illustrator Hannah Webster and Carissa Corlett who started The Misfits Club. Joanna Davies reflects on her adventures in making and Martha Goes Green look back to the 90s to create a party spread for our 20th. In our tutorial section: get addicted to stamp making, create a personalised flag for your holiday spot and sew some decorations for your tree. Extra Curricular is offset printed in full colour with vegetable based inks on beautiful 100% FSC Certified stock. *Orders are sent from Auckland, New Zealand and packaged in a cellophane bag to avoid water damage from leaky mailboxes! Overseas orders of multiple issues may be sent separately.